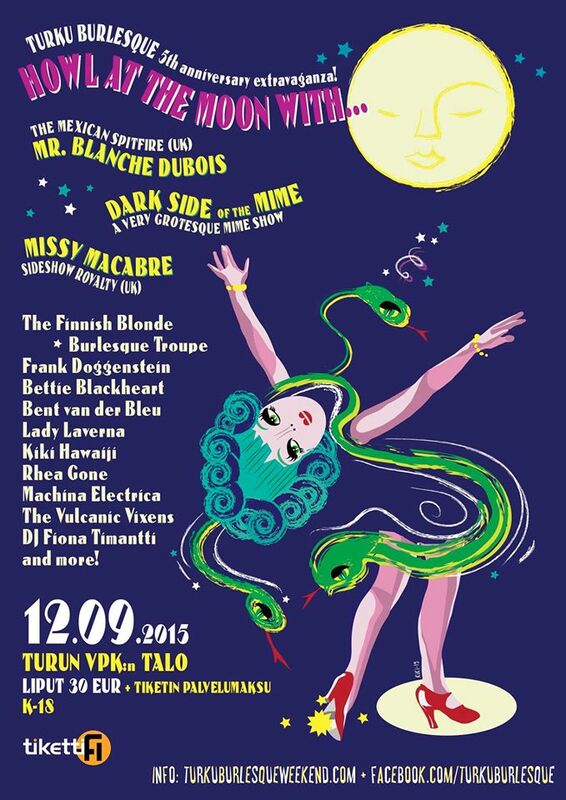 Description: The very first Turku burlesque event took place in the darkness of winter night in January 2010. Even if it feels like an eternity ago, now it is the time to celebrate the 5th anniversary! During Turku Burlesque Weekend we will travel through times and descend to the decades before and after the 1st world war. The weekend serves as an homage to the creative alliance of art and the entertainment and to the people, whose mental landscape was coloured with hope, unbearable lightness, escapistic delights, abundant pleasures and shameless decadence. The programme for the weekend of September 11-12th contains workshops and the Howl at the moon extravaganza! ball starring both international and Finnish burlesque, cabaret, sideshow and drag artists. Tickets to the HOWL AT THE MOON- extravaganza on Sept 12th at Brankku (Turun VPK:n talo) are now available from Tiketti. The price is 32,50 € (30 € ticket plus Tiketti service fee). Click Me to Buy now. And if you feel like parking in front of the stage, enjoy the night with your own company and see show right in front of your eyes – here is an unbeatable offer for you! The “VIP” pack include tickets for the show, a table for 4-6 persons and a welcome gift. Only a limited amount available, price 250 euros (including VAT). For more information and bookings, please contact: Kiki Hawaiji / Suvi Solkio, turkuburlesque@gmail.com.